Possesing highly important hair certainly isn't easy nor is it for the meek. 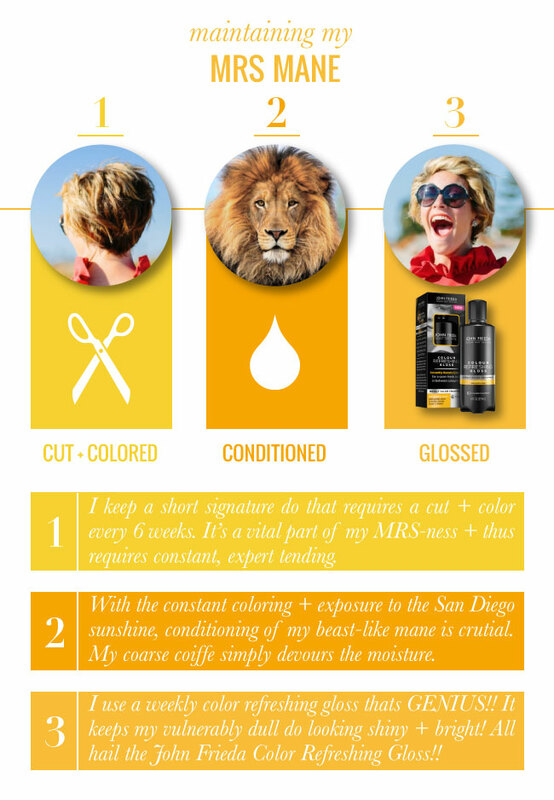 Having a mane maintainance program is what keeps my locks looking sleek, chic + unique! Through the years I've found what works through trial and error - and yes, I too have experienced life shattering hair terror. That said, I stick to what I know to be tried, true and beneficial - staying true to my mane maintenance program ensures this coiffe won't sizzle. I'm at the Beauty Parlor every 6 weeks - getting my hair cut + freshened up with bleachy streaks. When your do is tightly cropped - roots just don't look that good up top. Because I bleach my ends tend to get dry and brittle - so keeping them routinely trim certainly is beneficial. Do to the warm sunny climate in which I reside - along with the aforementioned bleaching, is recipe for hair suicide! My coarse thick hair simply devours conditioner - and thus I'm a weekly deep conditioner practitioner. My saving grace between salon visits? This John Frieda Color Refreshing Gloss... it's pure brilliance! This in-shower color refresher restores vibrancy and tone - it glosses up your tresses, eradicating all dullness... and you do it at home!! Each bottle contains 6 uses, one for each week of your hair coloring cycle - keeping your mane salon-fresh and delightful. So there you have it my MRS mane maintenance routine - the how, when + why behind my calculated hair regime.